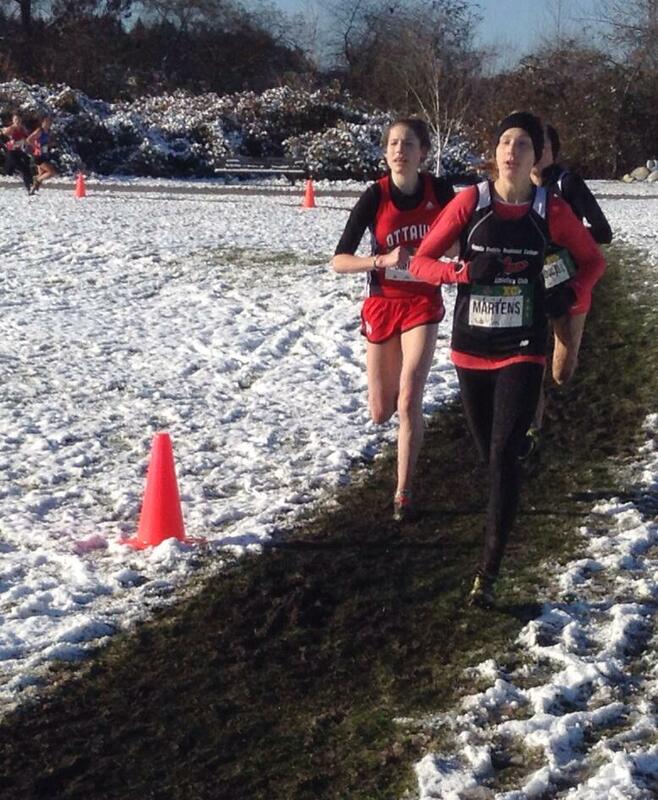 Wolves runner Mirelle Martens capped off her 2014 cross-country running season in style on Saturday capturing 3rd place in the Junior Women’s (19U) 6 km race at the Athletics Canada National Cross Country Running Championships in Vancouver. Martens got out to a quick start and ran in the lead pack of four runners for the first two laps of the three lap race. In the final lap, winner Hannah Woodhouse of Ontario separated herself from the field, and silver medalist Jennie Baragar-Petrash from Winnipeg rallied from 8th place. Martens dug deep in the final 400m to hold off four other runners in the battle for the bronze medal. Martens and five other runners earned spots on the 2015 Junior National Cross Country running team. They will represent Canada in the Pan Am Cross Country Running Championships in Columbia in February and the IAAF World Cross Country Running Championships in China in March. In the Junior Women’s team competition, Marten’s run helped Team Alberta place second behind Team Ontario. Four other Wolves Athletics Club runners also took part in the national meet. Kailey Bratland and Brittany Duval ran in the Youth Women’s (17U) 4 km race finishing in 93rd and 95th places, respectively. Jamie Wigmore was 44th in the Senior Women’s 8 km race while Hayden Hollowell was 58th in the Senior Men’s 10 km race. Former Wolves runner Fiona Benson, now running for Trinity Western University, placed 7th in the Senior Women’s race. This entry was posted in Cross Country and tagged Athletics Alberta, Athletics Canada, CCAA, Cross Country Running, Fiona Benson, GPRC Wolves, GPRC Wolves X-C Running, Grande Prairie, Hayden Hollowell, Jamie Wigmore, mirelle martens, Wolves Athletics Club, Wolves Cross Country Running. Bookmark the permalink.